On Saturday, Feb. 22, the City of Long Beach Animal Care Services (ACS) held an open house to present a “report card” for their progress in public safety, community engagement and outreach, and most importantly for the well-being of shelter pets. Parks, Recreation and Marine Director George Chapjian, under whose general management ACS has been since June 2011, opened the program. Lacey Miller, shelter manager of the spcaLA spoke of the partnership between the two organizations that share space in the Pitchford Companion Animal Village. Miller said that since the shelter opened in 2001, spcaLA has adopted out around 22,000 pets, many of which have come from ACS. This number does not include the additional pets adopted out by the shelter. ACS general manager Ted Stevens outlined 2013’s accomplishments, which include the three-member vet team; purchase of a state-of-the-art x-ray machine; a second Animal Care and Cruelty-Prevention Conference; with a third planned for May; and graduation of 14 students from ACS’s Explorer program. 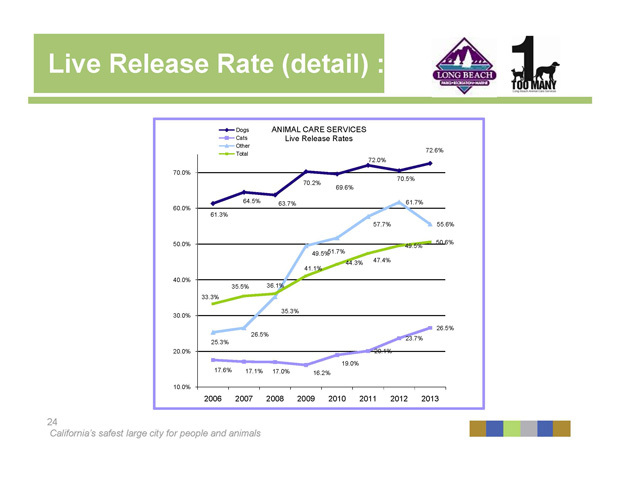 The year also saw implementation of a new Go Long Beach Animal Care Services app, which can be downloaded from iTunes and Google Play; a question from an attendee (disclosure: me) suggested that the app be enhanced in the future to include enforcement tools such as reporting backyard breeding and cruelty. The shelter also added further patrol for the Tidelands area and Rosie’s Dog Beach, received a grant for emergency shelter equipment, provided over 400 in-house spay/neuter procedures, conducted investigations that led to three animal-cruelty convictions as well as issued over 3,900 citations and warnings, and received $2.1 million in revenue from public support. 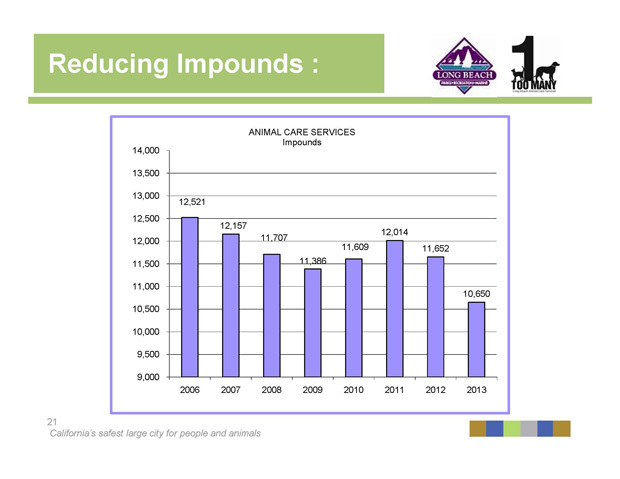 Stevens noted that the statistics for impound reduction, live release and euthanasia rate showed both steps in the right direction and a need for further action. Impounds of all animals—not only dogs, cats and rabbits but also wildlife, guinea pigs, fish, a Chinese golden-crested pheasant, ferrets, parrots, a serval cat (now at a rescue) and once, a rhumba of rattlesnakes that were sent to a sanctuary—were at their lowest, and live release was up for all animals except wildlife. The licensing program was instrumental in returning lost pets to their owners, and adoption coordinator Alex Macias and the adoption volunteer team furthered the process of finding pets forever homes. Animal advocate Judy Crumpton reminded attendees that microchipping all pets increases owner return. Stevens also credited rescue groups like Animal Match Rescue Team, West Coast Animal Rescue and Helen Sanders CatPaws for pulling numerous pets from the shelter and successfully adopting them, thus increasing live release and downticking euthanasia rates. “These partnerships, I can tell you, have been very significant,” Stevens said. The Others category consisted mainly of injured wildlife and consequently showed a drop. 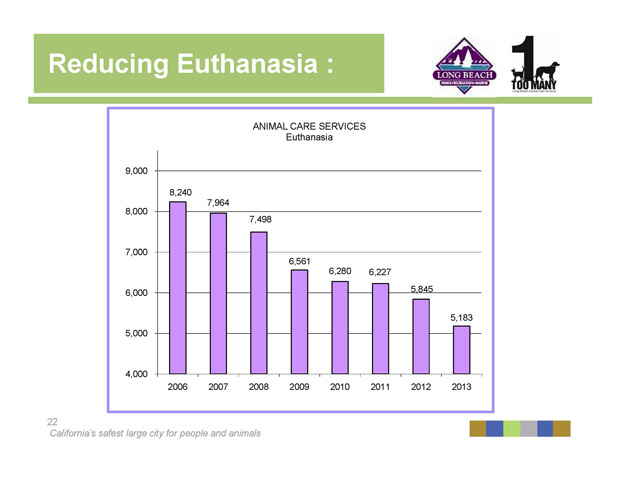 The euthanasia rate was shown to have been reduced 15 percent for dogs and 13 percent for cats. Stevens gave tremendous credit to the adoption volunteers and the low- and no-cost spay neuter programs, particularly Fix Long Beach, a grassroots all-volunteer effort to bring free spay/neuter procedures to low-income Long Beach residents via a mobile clinic. “Our status with Parks and Rec helped get permits for the clinics, and they’ve reaped benefits in the shelter,” Stevens said. In a separate conversation, Stevens said that shelter statistics will presently be posted on the ACS website for public review. Another major fix in the planning was presented by Friends of Long Beach Animals (FOLBA) president Bob Carleton in the form of a dual-purpose veterinary clinic funded wholly by FOLBA (read full story here), due to open on the shelter grounds the second week of April. The clinic will consist of four rooms: a 160-square-foot surgical room, a 340-square-foot animal -preparation and recovery room, office space and a storage area. “We’d been talking about this for a while, and now it’s getting real,” Carleton said. He credited Ruben Aceves, a CSULB student in the MBA program, for volunteering to form a marketing group for the clinic. Awards were presented to two individuals who were particularly instrumental in facilitating shelter pet adoption. Volunteer Jacob Smith was a “slam dunk,” Stevens said, for the Spirit of Dr. Eslinger Award as Rescue Partner of the Year. Smith rides his bike to the shelter five days a week, volunteering an eight-hour day in the effort to get as many pets as possible homed. The One Too Many Award recognizes outstanding contributions of staff, residents and local organizations to the mission of making Long Beach the safest large city for people and animals. One Too Many stands for one too many unwanted, abandoned, mistreated or euthanized pets, and professional photographer Sara Cozolino certainly deserved this award. Cozolino drives all the way up to the shelter from her home in Glendale to volunteer her talents, ensuring that animals make the best first impression possible to any prospective pet parents. Cozolino emotionally expressed her appreciation for the award, thanking shelter outreach worker Kelly Miott for being her “right-hand woman” and the rescue partners for passing it forward. Since the January Pet Post about Cozolino was posted, Steven Latham of the Shelter Me TV series (view episodes here) has picked up Cozolino’s photos on his shelter-adoption social website. Check Virtually Pets to see them. Stevens plans to move forward with the progressive changes and augmentations that came into being during the past year, especially as they relate to increasing live-release rates and working with the community and collaborative partners. In the planning are increasing response time as well as community outreach to educate about fixing pets, continuing to participate in offsite shelter adoptions at Gelson’s Market and The Pet Post USA’s (the other one) Second Chance Pet Event on April 13, the cruelty-prevention conference, and a Big Fix spay/neuter event. “We’ve got some really great things down the line,” Stevens said. There are many great pets for adoption at our shelter (I just got one, and I know this!). Here are a couple more. You can see the star shots by Sara Cozolino here. The shelter is located at 7700 Spring Street in the P.D. Pitchford Companion Animal Village, inside El Dorado Park. See photo below for entrance—it can get confusing there! People look great upside down, don’t they? 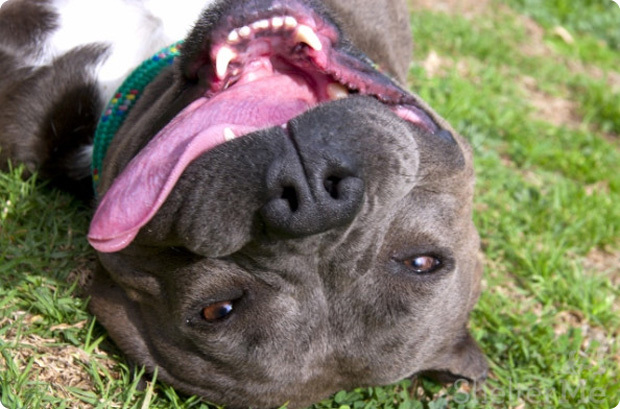 Poppy is a fine example of the overabundance of pitties left in shelters everywhere. She’s a 4-year-old medium-weight (i.e., 45 pounds) girl who wants to love and be loved. She’s smart, too—she responds to commands and is polite about treats. Volunteers say that she’ll be good for a family. Check out her video here. Senior cats can offer human forever friends calm, loving companionship. They’ve been around the block (it is hoped not literally), are litter box savvy and, like many of us, just want a warm, safe spot to be. 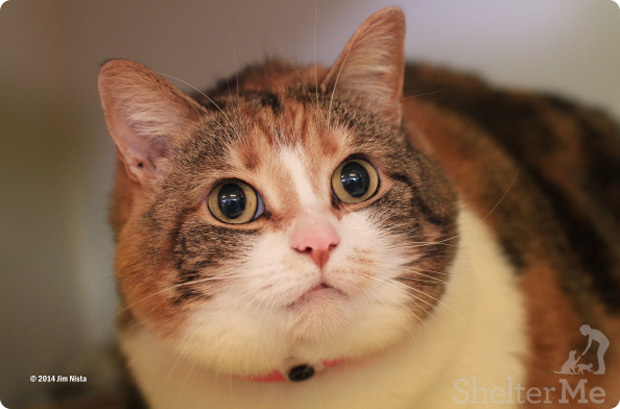 Kiela is a tabby/calico girl of 10. She’s friendly and loves to get her ears scratched, and still has a bit of play in her. You know those items at the checkout stand at the market—gourmet chocolates, candy, silly tabloids—that you just gotta get? On March 9, they’ll be outside the store in kennels, on leashes, in the arms of rescuers. Gelson’s Supermarket Long Beach is co-hosting the second West Coast Animal Rescue and Long Beach Spay and Neuter Pet Adoption Day, featuring pets from West Coast Animal Rescue, a local all-volunteer dog adoption network of friends, professionals, volunteers and local organizations that spays and neuters homeless dogs, walks and socializes them, gives them medical care and finds them forever homes; Long Beach Spay and Neuter, also all volunteer, which engages in feral and free-roaming cat trap/spay-neuter/release and finds homes for the tame kitties; and our shelter at Animal Care Services (ACS). The ultimate goal is to educate first-time and existing pet owners about the growing need to adopt and/or foster dogs and cats that need a second chance. 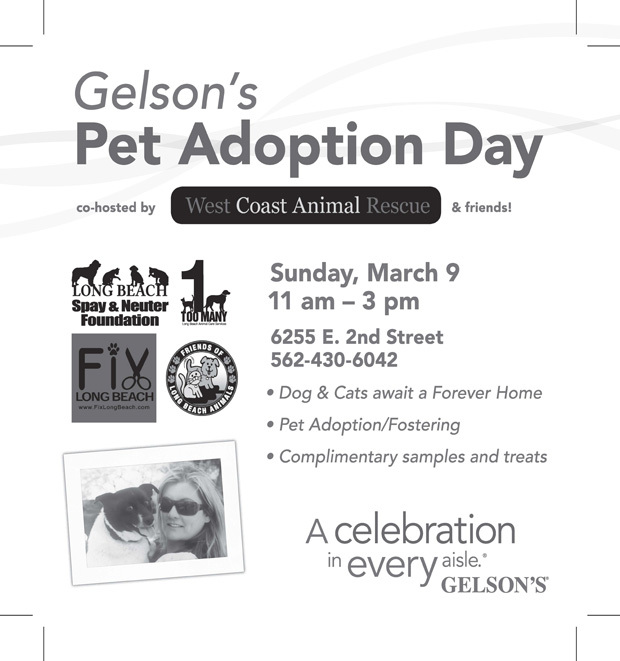 Long Beach Animal Care Services will be there with adoptable pets, and Friends of Long Beach Animals and Fix Long Beach will be there with information tables, and Gelson’s will be supply free samples from their pet partners and will give away a free reusable bag and store coupons with any donation to these groups. For more information, contact: Gelson’s Marketing Department 818-377-6494. Fix Long Beach, a community grassroots all-volunteer organization, is back, helping to reduce the number of unwanted animals and improve pet health. And with over 700 fixes, that’s a lot of baby animals who won’t be dumped on the streets or subject to shelter euthanasia. Free spay/neuter procedures have already been booked in advance, but visitors are encouraged to come in person to make appointments for future clinics. If you arrive at 7 for the waiting list, make sure that your cat or dog hasn’t had food or water after midnight. Microchipping, deworming and flea-control products as well as nail trimming are offered at discounted prices, and appointments are not necessary to get required shots for dogs and cats. If you live in Long Beach and are of low-income status and want to get your pet fixed, or know someone who is and does, please join us and make an appointment to help provide every pet with a healthier, happy life and to help reduce shelter overpopulation! 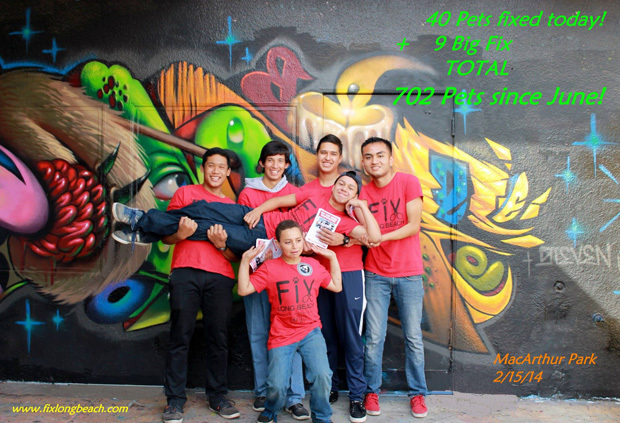 Fix Long Beach is all-volunteer and operates through donations. Clinic costs range from $2,900 to $3,500 depending on the number of cats against the number of dogs and each pet’s gender and weight. For more information or to donate to Fix Long Beach, call (323) 413-7729, visit Fix Long Beach on Facebook. Homeless kitties have several strikes against them, but you can tweak the definition of strike by entering this great event. You’ll help raise money for food, shelter and medical care for the cats at this great rescue, and you’ll have a good time doing it. The $35 per person entry fee includes a food basket, a soft drink, a drawing for prizes and two hours of bowling, with shoes. Sign-up sheet and further information available here.